A vastly different Midhurst line-up lost 4-1 at home to Oakwood but there were signs of promise for future games. The Stags handed debuts to Josh Bird, Chris Wyatt, Josh Wycherley and Jake Slater while another two former Midhurst players returned, Harry Farr and Callum Coker. The opening minutes were played at a frantic pace with both sides giving the ball away. 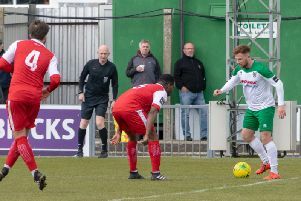 The visitors took an early lead inside five minutes from a set piece which was driven into the Stags box and only half cleared and fell to the unmarked Oluwaseun Olabiyi, who smashed home. As the half progressed the home side were getting a grip and created some good chances - the best arrived in the 17th minute where the home side were awarded a penalty. Up stepped Coker, who smashed his spot kick down the middle - but it clipped the top of the bar and flew over. Liam Dreckmann was looking dangerous on the left, putting in some dangerous crosses that Slater and Coker were unable to convert. Several more chances went begging and another sloppy goal was given away four minutes before the break, put away by Ross Jones. This affected the home side as ball was given away straight from the kick off another sloppy mistake at the back led to a clumsy challenge only for the referee to award a spot kick, which was placed to Bird's right by Abubacarr Touray Drammeh for a 3-0 interval lead. In the second half, both sides missed half chances before the visitors added a fourth in the 6th minute as a good break down the rightended in a smart finish across Bird by Charlie Adsett. Credit to the Stags, they never gave up - and the eye-catching Dreckmann did pull a goal back with ten minutes to go with a smart finish with his right foot from inside the area. The final ten minutes had the Stags kept pressing, but for no further reward. Midhurst: Bird, Wyatt, Casselton, R Carter, Farr, Brown, Behan, Wycherley, Coker,Slater, Dreckmann. Subs: Penfold, K Carter, Harrison, Scarborough.